Tom Knapp finally retired his old Benelli M1 Super 90 last year when he donated it to the Buffalo Bill Historic Center in Cody, Wyoming, where it will be put on permanent display next to the guns of other great exhibition shooters like Herb Parsons and Annie Oakley. Tom's old Benelli wasn't worn out, in fact it had never let Tom down, but it was after Tom sent his faithful Super 90 to the museum that he sat down and figured out how many rounds the gun had fired. With over 140 live shows per year, the total number of rounds put through the Benelli was over half a million. Well, it's a good thing Tom retired that gun, because at that pace he would have worn it out... in another hundred years or so. When Tom is performing shooting exhibitions around the world for Benelli, he doesn’t carry his guns with him. The Benelli importer for the country Tom is visiting supplies the Benelli models that Tom will use during his performance there. Tom assembles those guns right out of the box in front of his first audience- and then delivers a show-stopping shooting exhibition. Talk about confidence in Benelli quality, reliability and performance! For his spectacular exhibitions, Tom chooses these Benelli shotguns. His exhibition guns are usually equipped with extension tubes that allow the magazine to hold additional shells. Tom depends on high-performance Federal Premium ammunition to deliver the shot-after-shot consistency that has made him a legend. The Super Black Eagle II sets the standard for style, versatility and performance by which all other semi-auto shotguns are judged. This shotgun delivers the unfailing shot after shot reliability that top shooters count on. As the original 31/2" semi-auto shotgun, the Super Black Eagle was on the cutting edge of shotgun innovation. The newly-designed Super Black Eagle II continues that high performance tradition, while offering the revolutionary recoil-reducing ComforTech™ stock. The M2 Field is the true workhorse of the Benelli semi-auto line. Ruggedly built, yet light and nimble, the Benelli M2 is constructed around the ultra-reliable Inertia Driven� bolt mechanism. The Inertia Driven system allows the M2 to easily digest virtually any 12-gauge cartridge, from 2-3/4" target loads to the heaviest 3" magnums. The Benelli SuperNova is a revolutionary new modular concept in pump-action shotgun design. This amazing pump gun features a lightweight steel skeleton framework, over-molded with a high-tech polymer. This makes the new SuperNova ultra light, incredibly strong, and impervious to even the most brutal weather. If you are lucky enough to see one of Tom’s performances in a location that will accommodate rifle-fire, you’ll see the Shooting Star perform truly incredible shots with his BRNO Model 611, and HK Model 300 .22 rim-fire rifles. Again, Tom always counts on Federal Premium ammunition- in this case the TNT .22 magnum. Whether he’s hosting a network TV show or appearing as a guest on a popular outdoor show, Tom prefers to shoot Benelli’s SuperSport or Cordova shotguns. Of course Tom can make incredible things happen with a variety of Benelli shotguns, so you may also see him shooting other models. And you can rest assured that the ammunition is Federal Premium. Benelli’s SuperSport and Sport II deliver the ultimate “speed gun” performance for sporting clays. The SuperSport’s ComforTech™ recoil-dampening system allows a shooter to recover for that critical second-shot up to 69% faster than other comparable shotguns - that’s fast! Combine that quick recovery with a ported barrel that keeps muzzle climb to a minimum, and the speed becomes almost mind boggling. And keep in mind that the ComforTech™ system’s special gel-recoil pad and comb-insert reduce felt recoil by up to 48% versus the competition. Shooters often ask Tom if the SuperSport hunts. Check out Tom's sessions for Benelli's American Birdhunter and you’ll see that for pheasants in the field or waterfowl from the blind, the Sport II performs with a natural smooth swing and follow-through that allows any shooter to experience immediate success. Inspired by the high-volume dove shooting found around Cordoba, Argentina, the Cordoba was designed as a lightning-fast hunting gun that includes all the advanced features of a serious sporting-clays shotgun. The new Cordoba features a 10-mm tapered sporting-rib, favored by competition shooters, and porting to keep barrel climb to a minimum. You can count on the ComforTech™ stock to cushion the blow when an afternoon's ammo is measured by the case. The ComforTech™ system also helps reduce barrel climb, and puts the shooter back on target 69% faster, making the Cordoba possibly the fastest field-gun ever built. Tom enjoys shooting a wide variety of guns, especially those made famous during the “Old West”. 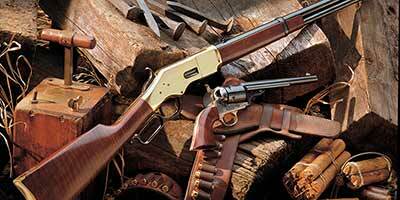 Among Tom’s favorites are the big-bore single action six-shooters, lever-action rifles, and the replicas of the single-shot rifles by Uberti.